v = v0 – gt where v0 is the velocity of projection and g is the acceleration due to gravity. 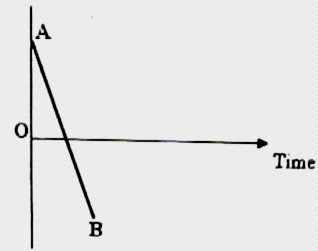 Therefore, the graph AB is the velocity-time graph of a body projected vertically upwards. Option (e) is correct. We have s = v0 t+ (½) at2 where s is the displacement in time t, v0 is the initial velocity and a is the acceleration. s = ½ gt2 = ½ ×10×(0.1)2 = 0.05 m = 5 cm. Therefore, in order to hit the target, the rifle is to be aimed at a point 5 cm above the target [Option (a)]. v2 = u2 + 2as where u is the initial velocity and v is the final velocity after a body moving with an acceleration a suffers a displacement s.
where g is the acceleration due to gravity. 52 – v2 = 42 from which v = 3 ms–1. √x = b t+ c where b and c are constants. When t = 0, v = 2bc. This is the initial velocity of the particle. [You can obtain the answers from the form of the equation, x = b2t2 + c2 + 2bct itself. This equation is in the form, x = x0 + v0t + ½ at2 which gives the displacement (x – x0) at the instant t of a particle moving along a straight line with acceleration a and initial velocity v0]. The time taken by the ball to reach the maximum height is 2 +1 = 3 s.
The maximum height reached is ut – ½ gt2 = 30×3 – ½ ×10×32 = 45 m.
(7) A car starts from rest and moves along straight road with uniform acceleration α for some time. Then it moves with uniform retardation β and comes to rest. If the total time of travel is t what is the maximum velocity attained by the car? From these equations, α t1 = β(t – t1). Or, t1(α+ β ) = βt from which t1 = βt /(α+ β ). From Eq. (i) the maximum velocity v = α t1. Substituting for t1, the maximum velocity v = αβt /(α+ β ). (8) In the above question what is the distance traveled during the decelerated part of the trip?